Downtown Farmers Market at Pioneer Park (300 S. 300 West) kicks off this Saturday, June 11. The 25th season of the Downtown Farmers Market at Pioneer Park (300 S. 300 West) kicks off this Saturday, June 11. As always, the market features fresh foods and produce, baked goods, food vendors, arts and crafts, music, how-to sessions and more, and will operate on Saturdays from 8 a.m. to 2 p.m. through Oct. 22. In addition, the market will open on Tuesdays, from Aug. 9 to Oct. 18, from 4 p.m. until dusk at the Gallivan Center (239 Main). SLCFarmersMarket.org. 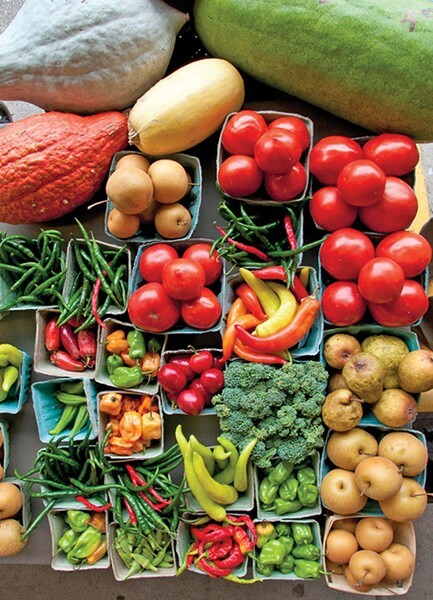 Don't have a lot of time to browse the goods at your local farmers market? With Farmers Market Direct you can shop your favorite vendors online from the convenience of your couch. The goods you order will be packaged and ready for pick up at the market when you get there. Participants include the Salt Lake City Downtown Farmers Market, Sugar House Farmers Market, Wasatch Front Farmers Market and Park Silly Sunday Market. To find out more, visit Farmers-Market.direct. Park City's biggest annual dinner party, Savor the Summit, takes place on Saturday, June 18, beginning at 6 p.m. Guests dine at a "Grande Table" that extends the entire length of Main Street in Park City's Old Town—from top to bottom. No ticket is needed to attend the event; diners simply make reservations with their favorite participating restaurant, and prices vary depending upon the dining establishment. Participating restaurants include Bandits' Grill & Bar, Bangkok Thai on Main, Bistro 412, Bodega on Main, Buona Vita, Butcher's Chop House & Bar, Café Terigo, Chimayo, Cisero's Ristorante, Cuisine Unlimited, Flanagan's, Fletcher's, Flying Sumo, Handle, High West Distillery, Purple Sage, Reef's, Riverhorse on Main, Shabu, Tavern, The Bridge Café, Tupelo, Wasatch Brew Pub and Zoom. In addition, Stay Park City is offering special overnight lodging deals for Savor the Summit guests and Park City visitors. For more details, visit ParkCityRestaurants.com and StayParkCity.com. Quote of the week: One cannot think well, love well, sleep well, if one has not dined well.